M2L is a completely integrated library system that has captured the attention of specialized, reference, public, and national libraries throughout the world. 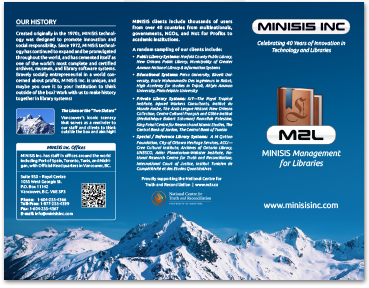 Officially released in 1998, M2L was originally developed with the participation of experts from the library community to meet the needs of small and medium-sized libraries. Through its easy-to-use graphic interface designed for a Microsoft Windows™ environment, M2L allows users to enter, import/export, and manage bibliographic data in an organized and easy to manipulate fashion. M2L also provides the capability to automatically download data from OCLC™ , the Library of Congress, and AMICUS™, and can be set up with the added possibility of developing similar download functionality for other national catalogues and international databases. Despite originally being designed for specialised/reference/private libraries, M2L is now garnering great interest in the public and lending libraries around the world. Simply due to its longevity, its ease of customization, and fully working integrated modules (eg. registration of serials, patron management and SDI) the M2L application is proving to be the ideal solution for any type of library be it academic, public, reference, research, or specialised. M2L was initially designed for specialised libraries that may or may not use MARC (or derivatives) for cataloging purposes. A MARC interface is fully integrated into M2L to enable users to choose the manner by which they wish to catalogue. Does the user want to see records in MARC format? Do they want to catalogue using MARC tags and delimiters? The user has the choice to use the validated MARC based interface or non-MARC for staff and users. M2L is fully integrated and self-contained, and is able to service the needs of any library or bibliographic center’s requirements. M2L also has a complete portal component and OPAC. Via the use of the MINISIS Web Interface (MWI), the M2L application can be given additional robust web searching and integration capabilities. Click on the image below to view or print a brochure.